Aaron Judge. Photo by Jason Schott. Yankees right fielder Aaron Judge is entering his third full major league season, and it is clear that he is the leader of the team by what he says about what the team has to do this season to build on what they achieved the past two seasons. 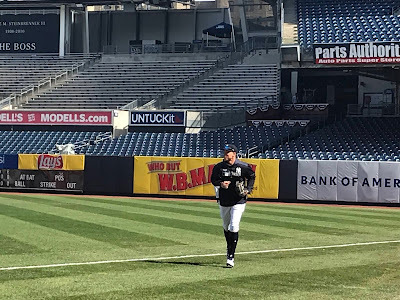 On Wednesday as they worked out ahead of Opening Day, Judge made clear that while the focus is always on championships in The Bronx, a more immediate goal is at hand to get there. "Going out there, our goal is to win the division, that's our number one thing, we haven't done it in quite a few years, so we can go from there," Judge declared. "If you didn't win it all last year, you definitely want to get farther than you did the year before, you know, in '17, we got within one game of a World Series and, last year, you know, leaving in the DS (American League Division Series against the Boston Red Sox), those games sting. "For us, our goal is to win the Division, first off, so we can line ourselves up for the playoffs. I feel that that's a huge advantage to have going into any playoff race is, you know, win your division and having time to set up your lineup and set your rotation, and get guys some rest in September when they need it because when your back's up against the wall, you know, all season long into September, battling every single inning and getting down to the wire, it's not only physically draining, it's mentally draining." The Yankees won 100 games last season, but finished eight games behind the Red Sox, and it's not hard to see where the American League East was lost. Their division record was a solid 44-32, but within that number is a telling trend that the Yankees need to avoid in 2018. While they went a respectable 9-10 against Boston and 10-9 against the 90-win Tampa Bay Rays, their record against the Baltimore Orioles, who went 47-115, and Toronto Blue Jays (73-89) left a lot to be desired. The Yankees went 12-7 against the Orioles and 13-6 against Toronto, meaning they lost 13 games to the two worst teams in their division. If they would have won half of those 13 games, plus get some games back from Detroit (64-98), whom they went 4-3 against, or Texas (67-95), who the Yankees won four out of seven games against, they would have won the division. The Yankees saw a very troubling flashback to last season when they dropped Saturday's game to Baltimore, 5-3, a game in which they made three errors and were 3-for-9 with runners in scoring position while leaving 11 runners on base. Judge made a big proclamation afterwards about how he felt, "Every game is important. You can go at the end of the year and look back and - last year we did that. So many missed opportunities and games we should have won but we just didn't come up with a big hit or a costly error, stuff like that. Every single game." The pain of the 2017 playoffs when the Yankees came back to win a Wild Card game, fought back from an 0-2 hole in the Division Series against Cleveland, and nearly came back from 0-2 down against Houston before losing in seven games, has stuck with Judge and informs a lot of his thinking. "We still have that mindset," Judge said. "Our backs are against the wall every single game, in the playoffs and especially in 2017, going into Cleveland and into Houston down two games. Our backs were against the wall and then we came out and played our butts off. That's got to be our mindset going into this last game (of the series on Sunday against Baltimore), our backs are against the wall. We can't take anybody lightly. We've got to capitalize on situations when they come up." On Sunday morning, Yankees Manager Aaron Boone was asked if his team should have a "backs against the wall" mentality just three games into the season, and he said, "We're a team that, one of the things we talk about a lot is, we want to be, you can't tell what's going on with us. I want us to have the ability to emotionally handle, withstand anything, turn the page each and every day, but there's an expectation that there's urgency every single day, and there's an expectation in our room, so, but that doesn't mean overreacting, underreacting, to anything that goes on within the course of a day because it is a grind and a haul of a season and you've got to have some emotional stability day-to-day and not get on the roller coaster ride, right, but come with the mindset every day that we're coming here to beat you down - that's our mindset and our expectation."